To be a human being (or indeed to be a primate) is to be attached to other fellow beings in relationships, from infancy on. This book examines what happens when the mechanisms of early attachment go awry, when caregiver and child do not form a relationship in which the child finds security in times of uncertainty and stress. Although John Bowlby, a psychiatrist and psychoanalyst, originally formulated attachment theory for the express purpose of understanding psychopathology across the life span, the concept of attachment was first adopted by psychologists studying typical development. In recent years, clinicians have rediscovered the potential of attachment theory to help them understand psychological/psychiatric disturbance, a potential that has now been amplified by decades of research on typical development. 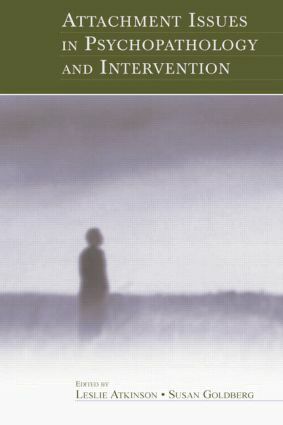 Attachment Issues in Psychopathology and Intervention is the first book to offer a comprehensive overview of the implications of current attachment research and theory for conceptualizing psychopathology and planning effective intervention efforts. It usefully integrates attachment considerations into other frameworks within which psychopathology has been described and points new directions for investigation. The contributors, who include some of the major architects of attachment theory, link what we have learned about attachment to difficulties across the life span, such as failure to thrive, social withdrawal, aggression, anxiety, depression, bipolar disorder, dissociation, trauma, schizo-affective disorder, narcissistic personality disorder, eating disorders, and comorbid disorders. While all chapters are illuminated by rich case examples and discuss intervention at length, half focus solely on interventions informed by attachment theory, such as toddler-parent psychotherapy and emotionally focused couples therapy. Mental health professionals and researchers alike will find much in this book to stimulate and facilitate effective new approaches to their work. "This book is a stimulating read…recommend it as a useful addition to residents specializing in child psychiatry and other related postgraduate disciplines." Contents: Preface. Part I: Psychopathology. L. Atkinson, S. Goldberg, Applications of Attachment: The Integration of Developmental and Clinical Traditions. B. Egeland, B. Carlson, Attachment and Psychopathology. D. Benoit, J. Coolbear, Disorders of Attachment and Failure to Thrive. K. Lyons-Ruth, S. Melnick, E. Bronfman, S. Sherry, L. Llanas, Hostile-Helpless Relational Models and Disorganized Attachment Patterns Between Parents and Their Young Children: Review of Research and Implications for Clinical Work. C. Hilburn-Cobb, Adolescent Psychopathology in Terms of Multiple Behavioral Systems: The Role of Attachment and Controlling Strategies and Frankly Disorganized Behavior. Part II: Intervention. R.R. Kobak, A. Esposito, Levels of Processing in Parent-Child Relationships: Implications for Clinical Assessment and Treatment. M. Dozier, B. Bates, Attachment State of Mind and the Treatment Relationship. A. Slade, Two Therapies: Attachment Organization and the Clinical Process. S. Johnson, An Antidote to Posttraumatic Stress Disorder: The Creation of Secure Attachment in Couples Therapy. D. Cicchetti, S.I. Toth, F.A. Rogosch, Toddler-Parent Psychotherapy for Depressed Mothers and Their Offspring: Implications for Attachment Theory.